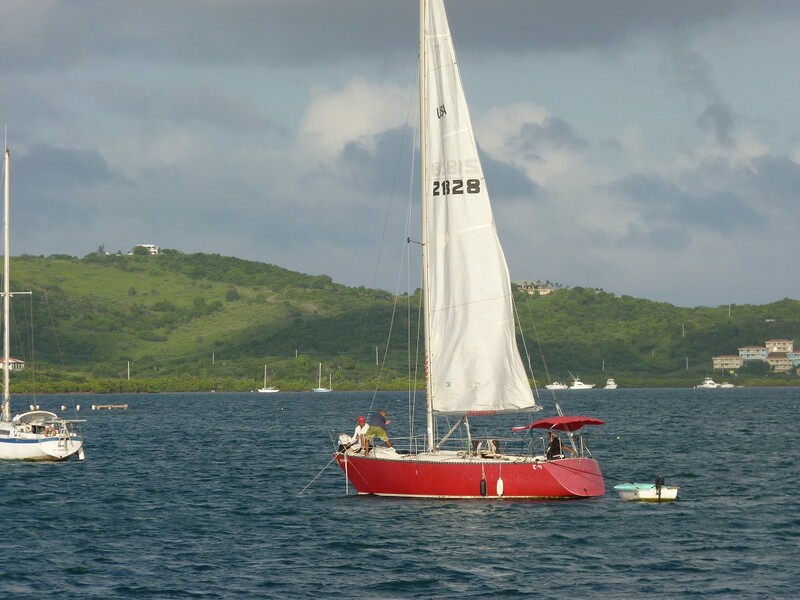 Catch up with Mar Azul as they move from Culebra to Palmas del Mar, where they tackle some shore chores in preparation for hurricane season and look forward to their next destination. 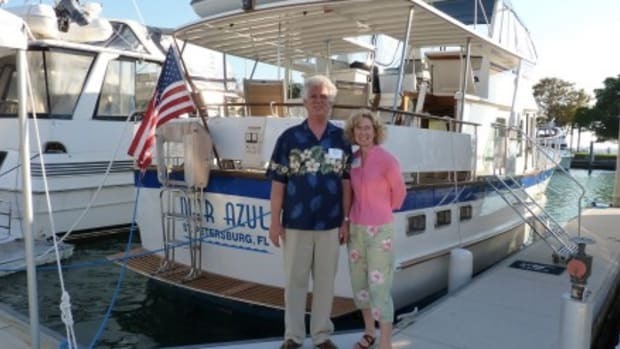 Follow along with Bob and Elaine Ebaugh aboard their 1985 DeFever 44, Mar Azul, as they spend two years cruising the waters off of South America from April 2011 through June 2013. 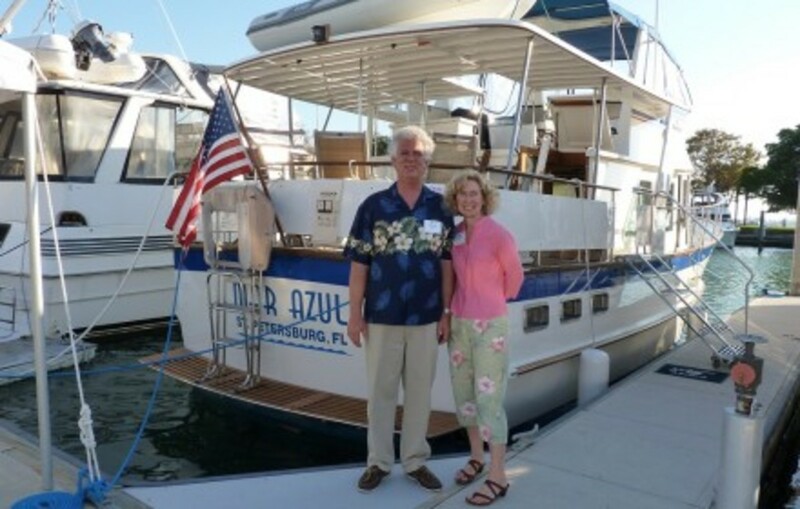 To learn more about Bob and Elaine as well as their home afloat click here. Neighborhood bar near the dinghy dock. We spent the holiday weekend relaxing. The weather wasn’t the best, and rain showers kept us below decks a bit, and also kept us cool. The town of Dewey is charming, with many small guesthouses and restaurants. The big attraction here is the beaches. 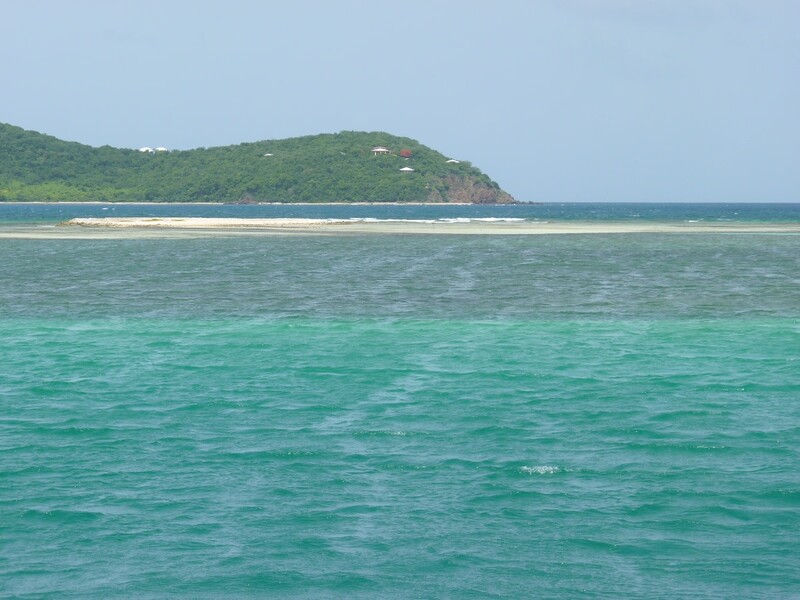 Most people come in via ferry from Fajardo (a $2 ride), and there is also a short field airstrip providing small plane access. 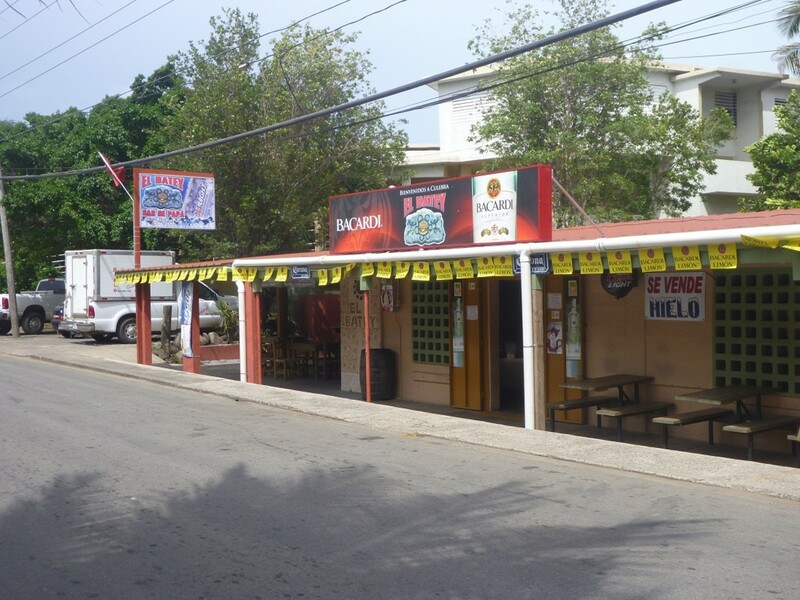 Dewey is quieter than the other waterfront Puerto Rican towns we have visited, and roosters crowing at all hours are the loudest noises coming from shore. The biggest excitement we have had here so far is getting run into by a sailboat one night in the anchorage. A group of three guys came out to a neighboring racing sailboat at sunset. It took them a long time to get disconnected from the mooring. There was lots of yelling in Spanish and we weren’t sure what was going on. Their line was probably wrapped around the boat’s keel. We thought it was odd they were going out at night, and it turned out they were just going for a joy ride within the large harbor. When they came back about an hour later, they had trouble picking up the mooring. Moorings can be tricky, and it was especially difficult as they had no motor and had to sail precisely up to the mooring in the moonless night. They had likely consumed a fair amount of liquid refreshment during their outing, which didn’t help the situation. They ended up navigating close to us on several attempts and on one pass got stuck dead into the wind and then ran into the side of our boat when their sails filled again. They were moving slowly and no one was hurt trying to fend off, with a small scratch the extent of the damage. It was still annoying, and a reminder that even sitting peacefully at anchor one can quickly be in harms way. The "Tranquilein" provided some excitement in the harbor one evening. 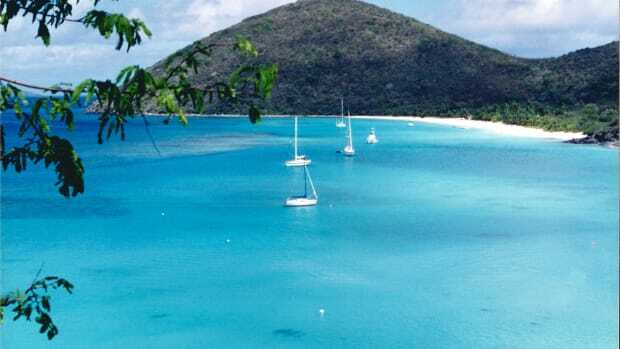 We want to get to Culebrita and Flamenco Beach on the north side of the island, but those plans are on hold for the moment as we are having mechanical problems, with an unsettling vibration in the starboard engine. Bob is assessing the situation – transmission vs. running gear vs. propeller? I would include a photo of Bob working in the engine room, but out of respect for the captain will just let you imagine him working there in his underwear (it saves on laundry) in the 100+ degree compartment, tools in hand, contemplating the dilemma. 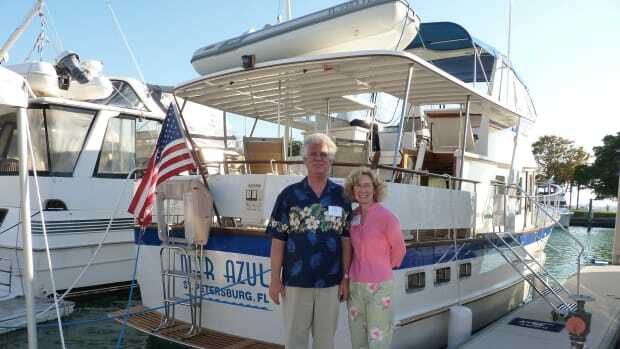 We spent two nights at the Dakity anchorage, nestled behind the reef at the entrance to the harbor. 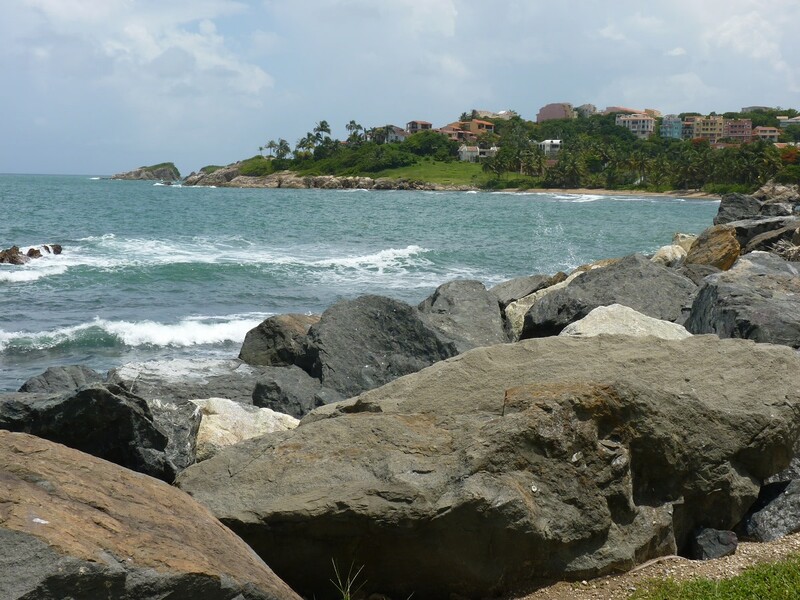 We are at Palmas del Mar this week, our summer home base near the town of Humacao, Puerto Rico. We are feeling spoiled at this beautiful place. The mechanical problem last week turned out to be a large piece of black poly line wrapped around the starboard propeller, which was easily removed. No vibration now, no big repair bill, and we are happy about that! We try to avoid running over fishermen’s pots but they can be hard to spot in the waves. Thankfully pots are much less numerous here than on the Gulf Coast of Florida because most of the water is so deep. On a sobering note, we heard that a 46-foot Bertram lost both engines just outside the breakwater here last week, attributed to lines fouling the propellers. The owner made it off the boat before it was destroyed from pounding on the rocks. Bob is working this week on a hurricane tie system, which he is squeezing in between sci-fi and murder mystery books. 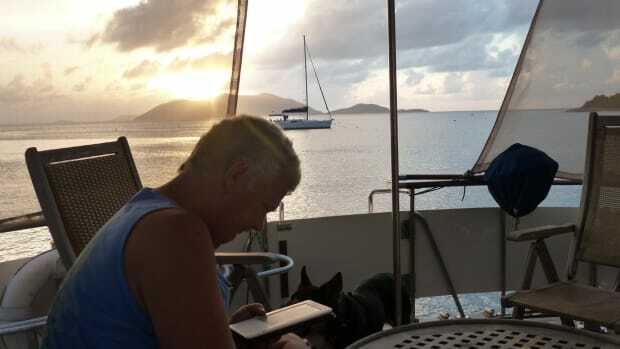 With pretty good Internet service here, I am catching up on correspondence and personal business, and trying to figure out how to get the dogs admitted to the BVI, one of our upcoming destinations. The galley chef also gets no rest most shore days, since we usually dine aboard in this new lifestyle. 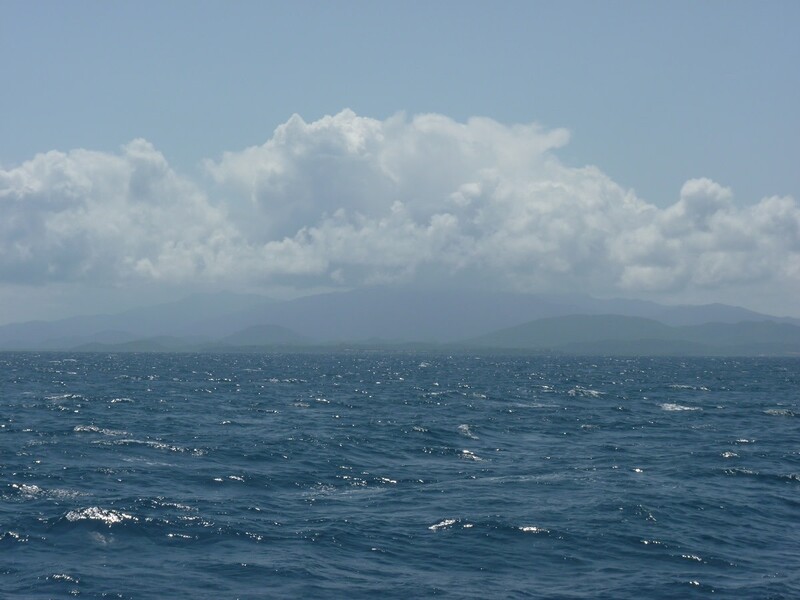 The mountain peaks of the El Yunque rain forest lie 15 miles to the north. 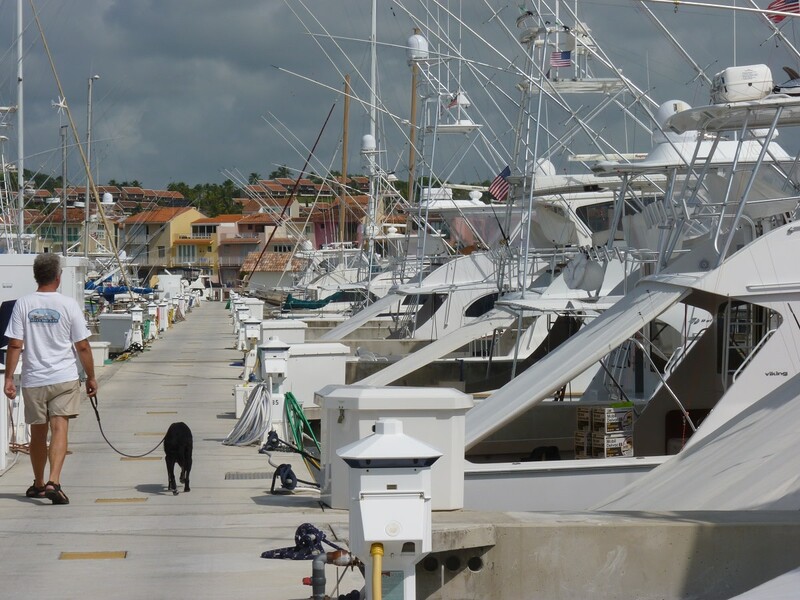 The majority of boats here are powerboats; Large sport fishing boats are most popular. 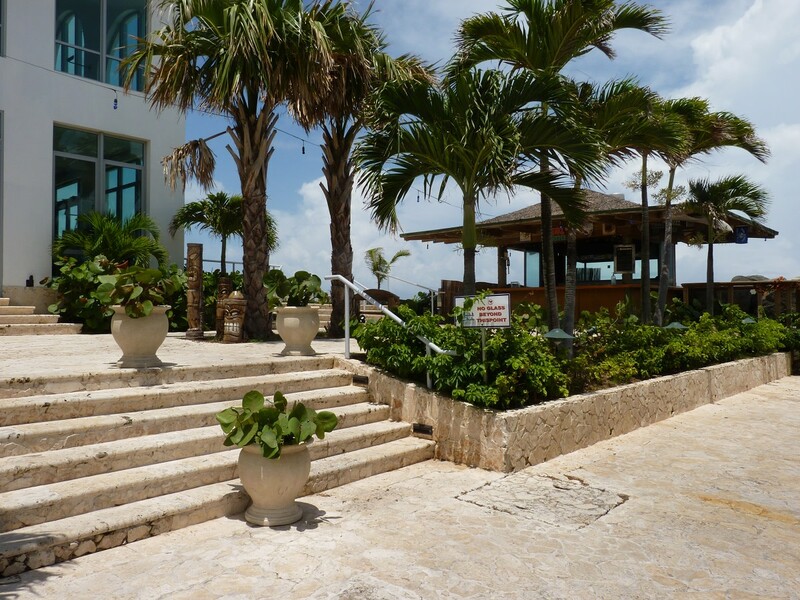 On weekends, the Pussers tiki bar is open, and delicious informal meals grilled and served outside. 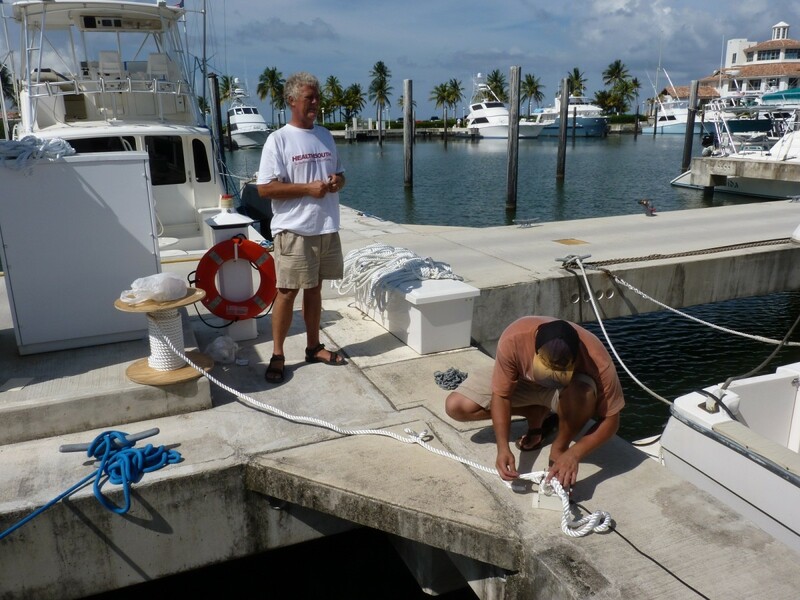 Bob and JJ measuring and splicing lines on the dock. We hope our preoccupation with storm preparations will prove to be a good exercise that is never executed. Bob completed the design for a storm tie system in this summer location. 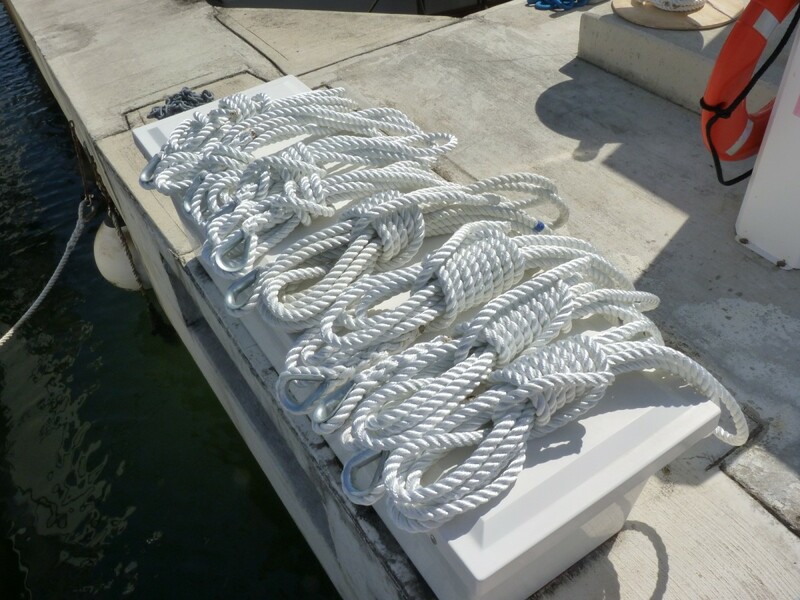 We have four anchors aboard for storm deployment in a harbor and extra dock lines and anchor rode, but ended up needing even more supplies to implement the plan. JJ was hired to splice the lines, since that isn&apos;t one of our better skills. We didn&apos;t want to practice on this important job. Preparing 13 lines was a full half-day&apos;s work. We’ll also need some last minute land arrangements if we need to leave the boat. Other than that, we are ready to go. After a week in port doing land chores we are ready to explore some new places. 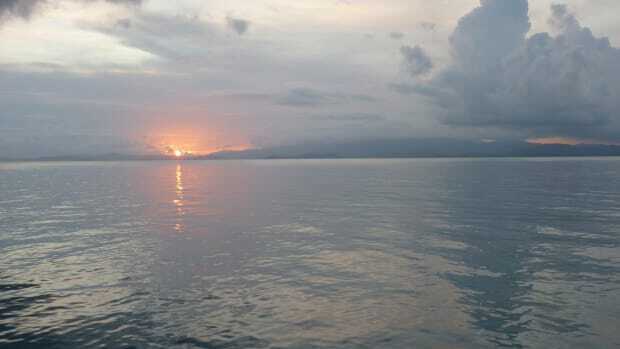 Next destination: Vieques. Hopefully those beautiful new lines will stay in the storage locker all season.